Abu’s Oasis Deli makes great Lebanese food. 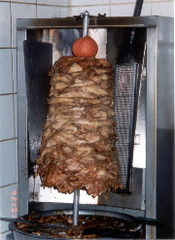 We really enjoy their schwarmas, which consists of grilled steak or chicken, onions and a really wonderful sauce all wrapped in a pita. My wife always gets chicken, while I get either steak or chicken. They’re made with lamb too, and you can even get them without meat. –Eric Ball, Grants Pass, Oregon. Abu’s Oasis Deli, 1330 NW 6th St., Grants Pass, OR 97526. Tel: (541) 476-1425. More than 90 wineries will participate in the 25th annual Santa Barbara County Vintners’ Festival Saturday, April 21 from 1 to 4 p.m. The festival has grown so large that this year it moves to a new site, River Park in Lompoc. In addition to the wines, festival goers can sample food from area restaurants. There is also a four-day schedule of winery open houses, dinners and other events starting Friday, April 20. For information on the festival and the open house schedule, go to www.SBCountyWines.com or call (805) 688-0881. Tickets are $75 ordered through the website or $80 at the event. Everything is wonderful at I Am Siam, but I especially like the lemon chicken. It’s not on the menu, but Bonnie Nanakon, the host and owner, suggested it. It is chicken breast, deep fried quickly, I think, very juicy and with a crust on the outside, served sliced on a platter. The lemon sauce has pieces of chopped lemon in it. Divine. –Gail G., Highland Park, IL. I Am Siam, 1 Huntington Lane, Wheeling, IL. (in a small shopping center). Tel: (847) 419-0698. If I have to eat a beef bowl, I’ll take kalbi sal dolsot at Tahoe Galbi, a Korean restaurant on Wilshire Boulevard in Los Angeles. Kalbi (alias galbi) is marinated beef rib meat. Sal means meat, and dolsot refers to the heavy black stone bowl in which this dish is served. The meat sits on a colorful arrangement of bean sprouts, spinach, shredded carrot, slivered zucchini, sliced shiitake mushrooms and pale, chewy long strands of toraji (bellflower root). Underneath is a bed of rice. On top, a raw egg yolk gleams like a small sun. As you toss the ingredients together, the egg cooks in the heat given off by the super hot bowl. And if you let the mixture sit while you eat other dishes, the rice cooks into an appetizing crisp shell. There’s almost no seasoning, an advantage for people not accustomed to spicy Korean food. Instead, the restaurant provides a squeeze bottle of hot red pepper paste which you can stir into the mixture or ignore. 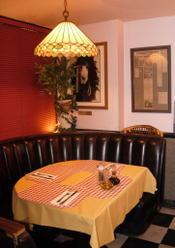 Tahoe Galbi Restaurant, 3986 Wilshire Blvd., Los Angeles 90010. Tel: (213) 365-9000. If Yuji Matsumoto hands you a business card, turn it over. On the back, you’ll see a reproduction of a sake label, a description of the sake, where it was produced and how to serve it. Matsumoto is no ordinary fan of the Japanese rice wine. He’s a sake sommelier and represented the western United States in the 2006 World Sake Sommelier Competition in Tokyo last October. The informative cards are the tags he attaches to the glasses used in sake tastings. At a tasting held at Tokyo Table in Beverly Hills, where Matsumoto is sake sommelier, it took only three examples to show how diverse this wine can be. 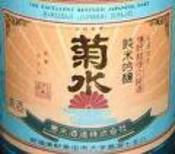 The first was Kikusui Junmai Ginjo from the Kikusui Shuzo brewery in Shibata, Niigata Prefecture. “Crisp and smooth, light to medium body, well-balanced acidity, floral aroma,” said the card. Drink it with sashimi, Matsumoto suggested. The next sake was soft, smooth, even a little sweet. This was Okunomatsu Tokubetsu Junmai, produced by the Okunomatsu Shuzo brewery in Nihonmatsu, Fukushima Prefecture. Matsumoto set out dried fruit to taste with this sake and recommended serving it with smoked salmon and salmon caviar. A rich, sherry-like nuance stood out in the third sake, Nanbu Bijin Tokubetsu Junmai from Nanbubijin brewery in Ninohe City, Iwate Prefecture. Matsumoto would serve this one with seared albacore with ponzu sauce or as an appetizer wine with blue cheese. Most popular with the tasters in my group was number one, Kikusui Junmai Ginjo, possibly because it was light and dry, a good complement to a wide variety of food. All three sakes are available in local markets, as well as at Tokyo Table, which stocks almost 20 sakes to go with a menu of sake-friendly food. Tokyo Table Restaurant & Bar, 50 N. La Cienega Blvd., Beverly Hills, CA 90211. Tel: (310) 657-9500. There is very little English spoken at Pho Hoa in Tamarac, Florida. We usually order the more exotic dishes, such as pho chin, nam, gau, gan, ve don, which is noodle soup with brisket, flank, tendon, fatty and crunchy flank steak. But every one is a winner. We've tried almost all of them. --ELMO, Columbia County, New York. Starr says she'll take a month off, then look for another site. She'll serve the same pastas and pizzas. And she'll take along some of the quirky decorations, like the painting of her basset hound in front of the Taj Mahal, illuminated by a glowing sun in the form of a pizza, that decorates a counter at the back. Of course, the new restaurant won't be on South Lake Avenue, so SLIK will be gone forever. South Lake Italian Kitchen, 524 S. Lake Ave., Pasadena, Calif. 91101. (626) 792-5984. For fine dining in Southern California, there isn't a restaurant I've been to in LA--Sona, Lucques, AOC, Campanile, etc--that thrills me as much as Laja on Highway 3 between Tecate and Ensenada. Best yellowtail of my life there….carpaccio with avocado, preserved lemon and fennel. And a grapefruit and yerba santa granita. Manzanilla in Ensenada comes a close second. Both use true Southern California produce, meat, fish and WINE, and the experience is like eating Tuscan cuisine in Tuscany.